The Violin Clip suspension mount is designed to easily clamp onto the strings of a violin in the bridge area behind the top plate allowing for the precise mounting of a Rode Lavalier microphone. 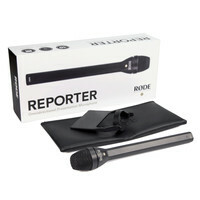 The Rode Reporter Microphone is an dynamic omnidirectional handheld presentation and interview microphone that offers a whole new sense of freedom as the omnidirectional pickup pattern reduces issues often found with directional microphones allowing you to focus on the task at hand without worrying about microphone direction and unwanted background noise. Please note this item was returned unwanted from a customer. The original boxing is scuffed and all the seals are broken. Otherwise the unit itself looks and operates as new and has only been used a couple of times. Directional Video Condenser Microphone. 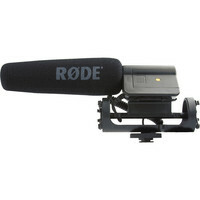 The RODE VideoMic is a professional grade shotgun microphone. Based on the latest Film industry technology the VideoMic is designed specifically for use with Video Cameras and Audio Recorders. Purchase this Rode VideoMic Go between April 7th and December 31st 2015 and claim a free copy of the new PluralEyes Express application for Windows and Mac upon registration of your extended warranty. Please note this item was returned unwanted from a customer. The original boxing is scuffed and all the seals are broken. Otherwise the unit itself looks and operates as new and has only been used a couple of times. 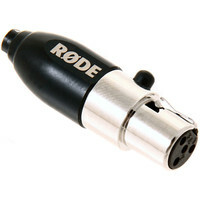 The Rode VideoMic Go is the smallest lightest and simplest Video Mic yet from Rode. It is perfect for anyone looking to get started shooting high-def video with a DSLR point and shoot or GoPro camera. Its a simple to use plug and go mic for video. 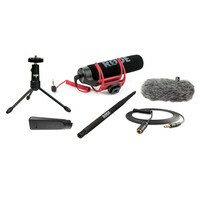 This package also includes a furry cover designed to minimise wind noise whilst remaining acoustically transparent a cold shoe pistol grip stereo extension cable an extendable boom pole and a collapsible mini tripod. Purchase this Rode VideoMic Go between April 7th and December 31st 2015 and claim a free copy of the new PluralEyes Express application for Windows and Mac upon registration of your extended warranty. 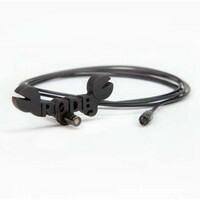 The RÃ˜DE iClamp is a heavy-duty clamp designed to provide additional support for your iXY stereo microphone during high movement usage with an iPhone 4 or iPhone 4S. The Rode MICON-7 connector provides easy integration of the Rode HS1 headsetPinMic and Lavalier microphones with a wide range of wireless systems. The RM2 is a low profile professional stand mount for the RODE NT1-A NT2-A NT1000 NT2000 NTK K2 Classic II Broadcaster Procaster and Podcaster microphones. The RodeGrip+ is a multi-purpose mounting solution for the Apple iPhone 5/5S. Featuring a camera-shoe mount with a 3/8″ thread in the base that can be mounted in three different positions the RÃ˜DEGrip can be used in a number of orientations and setups. 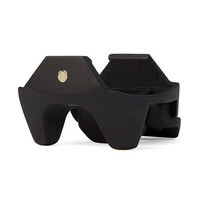 The RodeGrip+ also includes 3 different lenses for versatile filming with the iPhone. The RÃ˜DEGrip is a multi-purpose mounting solution for the Apple iPhone 5/5S. Featuring a camera-shoe mount with a 3/8″ thread in the base that can be mounted in three different positions the RÃ˜DEGrip can be used in a number of orientations and setups. The Rode NTR Ribbon Microphone is the ultimate ribbon microphone for recording applications equally suited to performance halls world-class professional studios and home recording spaces. Featuring internal shock mounting and one of the thinnest ribbon elements in existence the NTR is capable of recording sound from a multitude of sources with unparalleled detail and accuracy. br>This item is an ex showroom display model. There are light scuffs and signs of use around the casing. The original boxing and manual are not included. Otherwise the unit operates as new.This is a great opportunity to buy a fully functioning product at a discounted price supplied with a one year warranty.Software bundled with the original new product may have been registered or may no longer be included. 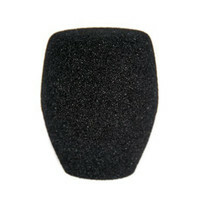 Compact 1/2″ Cardioid Condenser Microphone. 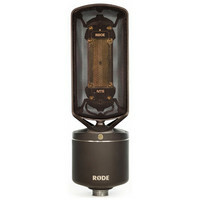 The Rode NT5 is a masterpiece of small-diaphragm cardioid-condenser microphone design. This item was returned unwanted from a customer. The original boxing is scuffed. Otherwise the unit itself looks and operates as new and has only been used a couple of times. This is a great opportunity to buy a fully functioning product at a discounted price supplied with a one year warranty. 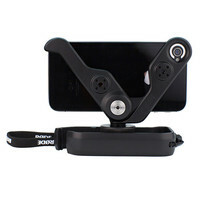 The RodeGrip+ is a multi-purpose mounting solution for the Apple iPhone 4/4S. Featuring a camera-shoe mount with a 3/8″ thread in the base that can be mounted in three different positions the RodeGrip+ can be used in a number of orientations and setups. 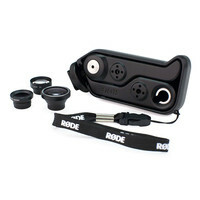 The RodeGrip+ also includes 3 different lenses for versatile filming with the iPhone.